Note of April 30, 2014: A reader has provided a translation for a page written in shorthand. Please scroll down to the comments section for the translation. 1880s autograph album that was presented to Minnie Kennedy at New York on 12 November 1884 by her cousin Amelie Fitzsimmons. 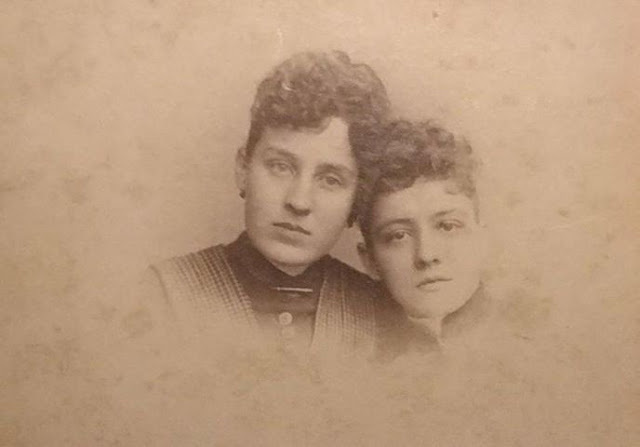 Note: A reader has forwarded a photograph of Minnie Kennedy and May Duval, taken on January 7, 1888. I don't know if Amelie was Minnie's blood cousin, or cousin by marriage. Amelie Catherine (Faurie) Fitzsimmons was the daughter of Jacques Clement Louis Faurie and Harriet Isabella (Nutter) Faurie. She married Robert Murray Fitzsimmons, who was born in Canada and possibly hailed from the Brockville, Ontario area. 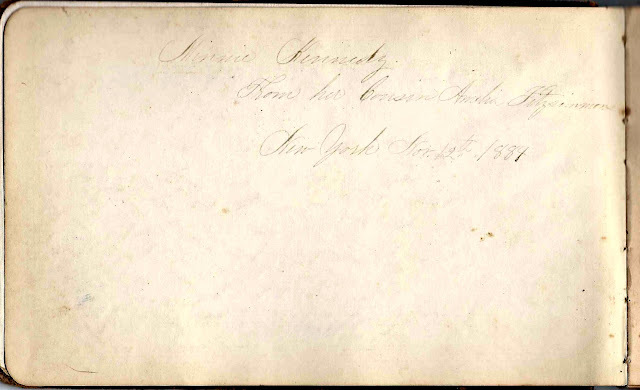 I haven't yet found the family of Minnie Kennedy, but there are interesting connections throughout the album, which contains the autographs of people in three areas: the New York City and New Jersey area; the Brockville, Ontario area and New Orleans, Louisiana. The album is approximately 7-3/4" x 5" and contains the sentiments of about 50 people. An alphabetical list of the signers appears at the end of this post. Cousin Amelia signed a page in the album. I don't know if she was Amelie Fitzsimmons, who gifted the album, or possibly Amelia (Kennedy) Overell. I wouldn't have made the possible connection of Amelia (Kennedy) Overell, except that later on in the album I came upon the signature of an Alfred E. Overell. The Overell surname triggered a memory, so I searched the Heirlooms Reunited archive. It seems that some time ago I featured the 1910 graduation of Yarmouth High School at Yarmouth, Maine. Because the class was small, I had researched the family history of the graduates, one of whom was Chesley Chapman Barbour, who married Irene Inez Overell, daughter of Albert Edward Overell and Amelie (Kennedy) Overell. And as it turns out, Amelie was born in Louisiana and the Overells lived for a time in Ontario. Imagine all the interconnections we could find if we only had the time and inclination! Amelie (Kennedy) Overell was the daughter of Civil War Confederate Colonel John J. G. Kennedy and Adeline (Cuevas, sometimes seen as Quave) Kennedy. I don't know the names of Colonel Kennedy's parents, but the parents of Adeline (Cuevas) Kennedy were Charles Ferdinand Cuevas and Rose Desiree (Caillavet) Cuevas. Rose reputedly had Choctaw ancestry, and an online reference I found indicated that her descendants attempted to prove this ancestry and were asked by the Tribe to help them in their 1913 attempt to obtain federal recognition. The archive of Colonel John J. G. Kennedy was offered at an auction and was described in detail here. There was no information on his parents, but he was described as a watchmaker before his military career and a lamp dealer after. Alfred Edward Overell created an especially appealing page. He affixed what I think is a hand done painting by means of four slits to a page in the album. Hopefully a reader with knowledge of the Kennedy and Overell families will leave a comment that explains the relationship, if any, between the album owner Minnie Kennedy and Amelia (Kennedy) Overell. 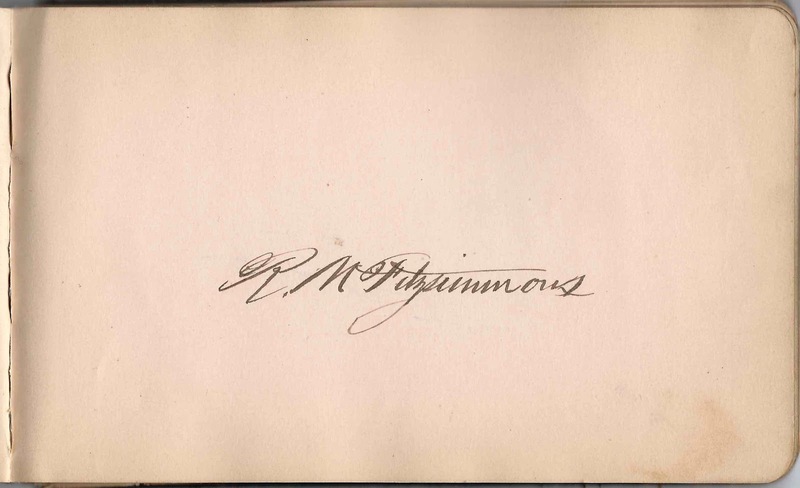 I'm assuming that the R. M. Fitzsimmons who signed the page below was Robert Murray Fitzsimmons, husband of Amelie Catherine (Faurie) Fitzsimmons. 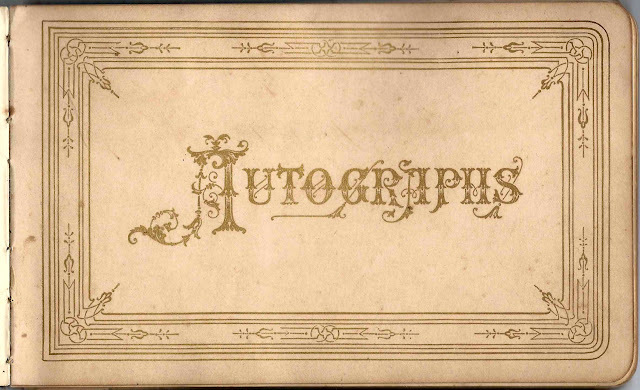 Addie Fitzsimmons signed a page at Brockville, Ontario, on 18 September 1885. It seems likely that she was related to Robert Murray Fitzsimmons, who was born in Canada. In what may be a coincidence, or not, Addie married Frankford Armstrong. 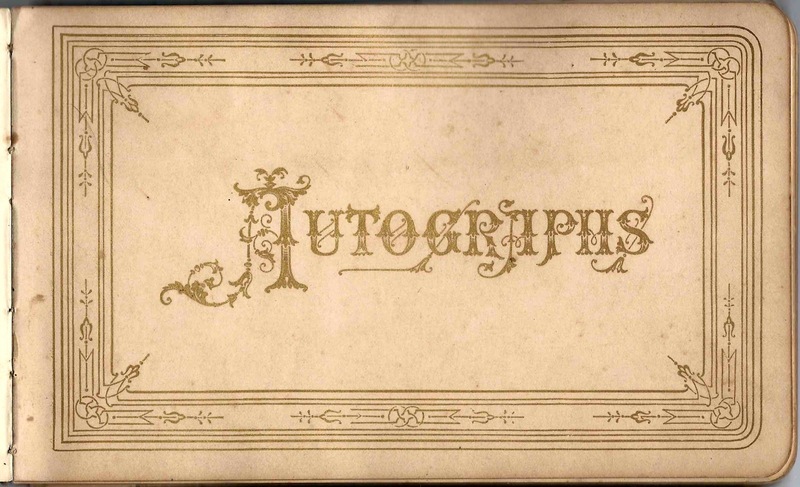 There was a signer named Guy Armstrong of New Orleans, who signed a page on 30 April 1887. Another coincidence? If you have knowledge of the Kennedy, Fitzsimmons, Faurie, Nutter and Overell families, or information on any of the signers listed below, please leave a comment or contact me directly. There is definitely an interesting story here! Another appealing page was colored by W. F. Graves of New Brighton, Staten Island, in 1890. 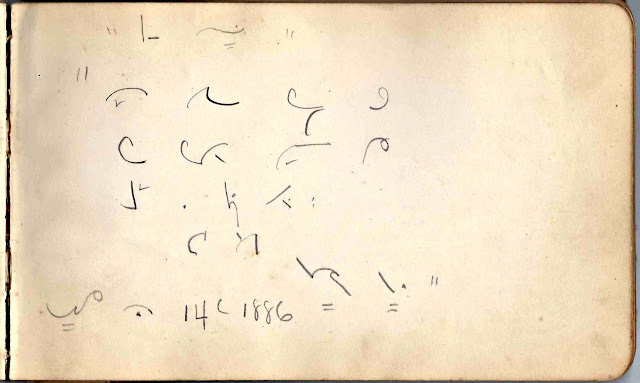 T. P. Leathers, Jr. of New Orleans signed a page on 29 January 1886, aboard the Steamer Natchez. Grace, signed at New York, on 21 February 1890 "Minnie, Had I the power to carve or print Thy future my dear friend, It would be fair and ever bright, Unclouded to the end. Your Friend, Grace"
Emile, signed at New Orleans on 15 January 1886 "To Minnie, Had I the power to carve or print, They future, my dear friend, It would be fair and ever bright, Unclouded to the end." J. A. B. "Good bye, I am off on the rail this eve. Until I turn up again think of me only as your most loyal drummer boy." Maggie, signed at Hoboken, New Jersey on 18 February 1890 "Dear Minnie, May that blessed gift of peace Be thine through life and never ?, That comes to us with a Saviour's love Continually from his throne above, Yours, Maggie"
N. E. B. "To Minnie, Sweet is the girl who reads this line, I wish her sweetness were all mine!" Arthur L. "Be true to yourself and you will be true to others." He placed his phrase within an intricate sketch. K. O. G., "Engaged for Painting"
Juliet Louise, signed at New Orleans, on 16 August 1886 "Darling Minnie, 'In coming years should fate decree That you and I must part, Remember absence will but stamp Thy image on my heart.' Your true and devoted friend Juliet Louise"
Initials are possibly V. B, signed on 8 April 1888. "To Miss Minnie, The hollow world cannot deceive this to many hearts in is love you. [?] One of thine, V. B." A note pinned to the page by Louise "May happiness be thy share In life, my friend, and may there Never be aught of sorrow in thy little skye. Nothing but perfect happiness till you die. In life's battle, no pain for thee, Ever victorious and triumphant be. 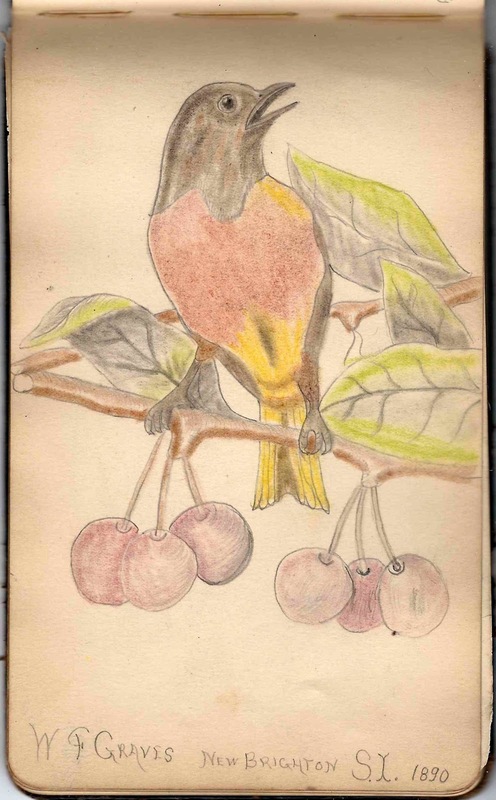 Ever your friend, Louise"
Emile Baumgarden, signed at New Orleans, Louisiana, on 15 January 1886. 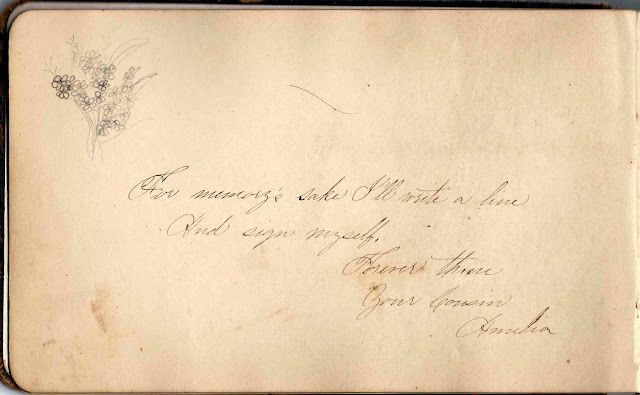 His handwriting appears to be that of another signer, Emile, who signed another page on the same day, but I can't be sure. 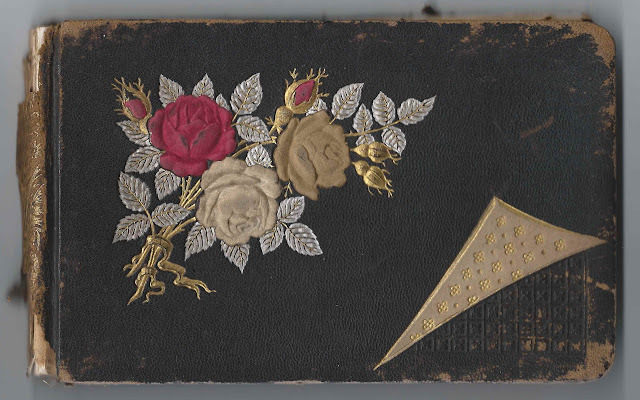 Page originally signed by Mrs. W. H. Belt of New Orleans, Louisiana, on 25 May 1887. Her husband W. H. Belt added his name diagonally in the upper right corner and "truly your friend". Jennie Cranston of Brockville, Ontario, signed on 19 September 1885. Although her surname is hard to decipher, I believe it's Cranston. There was a Jennie Cranston married to a James Cranston at Brockville. 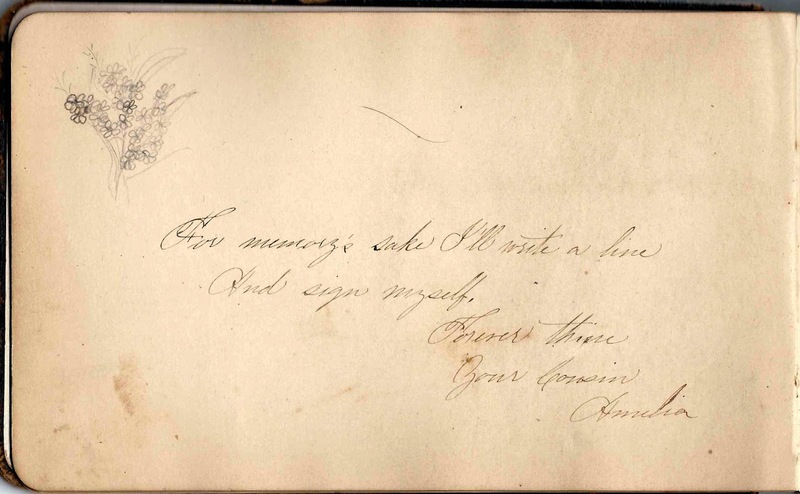 James Cranston also signed a page in the album, and Jennie's daughter Addie Fitzsimmons from a previous marriage also signed a page. How Addie relates to signer Robert M. Fitzsimmons and wife Amelie Catherine (Faurie) Fitzsimmons is as yet undetermined. Minnie Kennedy, from her Cousin Amelie Fitzsimmons, New York 12 November 1884 Nee Amelie Catherine Faurie, daughter of Jacques Clement Louis Faurie and Harriet Isabell (Nutter) Faurie and wife of Robert Murray Fitzsimmons. Whether Amelie and Minnie were blood cousins or cousins-in-law, is as yet undetermined. R. M. Fitzsimmons, presumably Robert Murray Fitzsimmons, husband of Minnie's cousin Amelie Catherine (Faurie) Fitzsimmons. He was born in Canada about 1852 and may be the Brockville, Ontario connection. Addie Fitzsimmons, signed at Brockville, Ontario, on 18 September 1885 "Dear Minnie, May heaven protect and keep thee from every sorrow free, And grant thee every blessing Is my earnest prayer for thee." 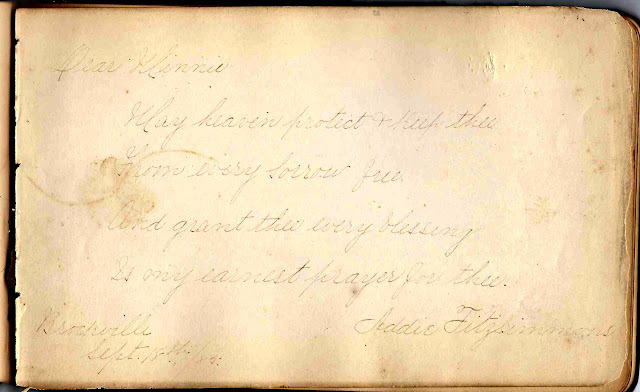 I think Addie was the stepdaughter of signer James Cranston, and thus likely the daughter of James' wife Jennie, and presumably a relative of Robert Murray Fitzsimmons. Interestingly, Addie married Frankford Armstrong, and there was another signer named Guy Armstrong from New Orleans. Another connection between Ontario and New Orleans? Lucy Mace Freeman, signed at New York City "They bill and coo before they're wed, They joy in lover's laughter; But when the marriage words are said, It's mostly bill thereafter." W. F. Graves of New Brighton, S.I. [Staten Island, New York], 1890 Drew a colored sketch of a bird on a cherry tree. John S. Kendall, signed at New Orleans, Louisiana, on 223 February 1887 "When this you see, Put on your specs and think of me." He drew a sketch of a feathered ink pen. Maggie Leathers, signed at New Orleans, Louisiana "Yours truly" Perhaps Mary Magdalene Leathers, whose brother Thomas Paul Leathers signed another page. 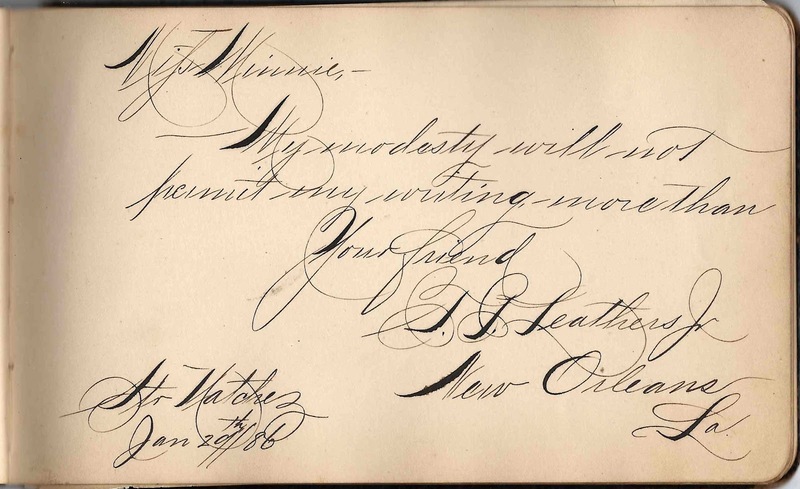 T. P. Leathers, Jr., of New Orleans, Louisiana, signed on the Steamer Natchez on 29 January 1886 "Miss Minnie, My modesty will not permit my writing more than Your Friend". Although his initials are hard to read, I believe he was Thomas Paul Leathers, Jr.
Arthur E. Overell of Brockville, Ontario. 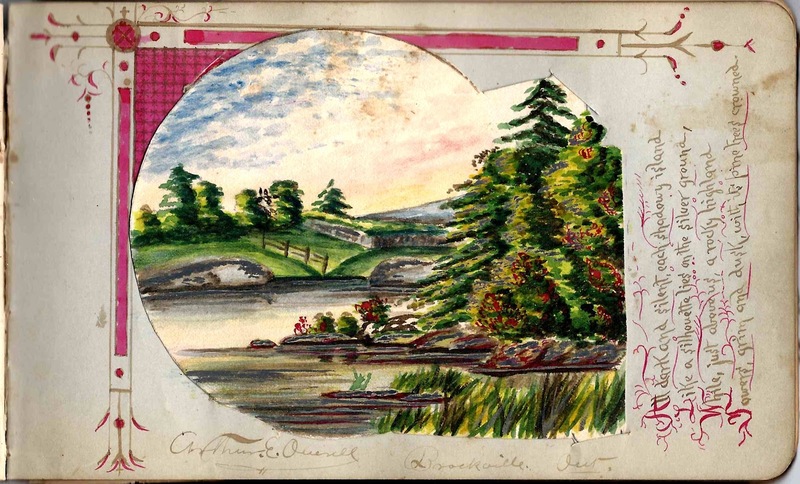 He cut four slits in the page and inserted a scene he may have painted himself. He may have been the Arthur Edward Overell who married Amelie Kennedy, daughter of Col. John J. G. Kennedy and Amelie (Cuevas or Quave) Kennedy of New Orleans and Alabama. How Amelie (Kennedy) Overell and album owner Minnie Kennedy were related is as yet undetermined. Minnie E. Potter, signed at Brooklyn, New York, on 16 November 1889 "My dear Minnie: - Ah, true it is our path through life Lies not neath perfumed bowers; For even on the brightest days, Oft come the darkest hours. And when the darkness is dispelled - We hope dispelled forever - It comes again as if compelled to linger on forever. Your sincere friend, Minnie E. Potter" A German or Dutch phrase in a different ink was penned in the upper right corner. "Meine Freunden ?oh LuebenZee"
Mrs. Stevens, signed at New York City on 22 February 1890 "Dear Minnie, May no clouds darken your path through Life is the wish of your Sincere friend"
Courtenay L. Winchester "Thine should be the sweetest flowers, If I knew where they grow, And thine should be the happiest hours, Would wishing make it so." T. K. Winchester, signed at New Orleans, Louisiana, on 16 February 1886 "To Miss Minnie: 'Though the hollow world deceive thee, Mine's a heart that never will-' "
"My love for you(r) sure/surely/shall? Thank you so much for providing this translation! I've edited the blog post with a heads up to scroll down to your comment.